New Arcadia is a city-sized oil rig off the coast of the Canadian Maritimes, now owned by one very wealthy, powerful, byzantine family: Lynch Ltd. Hwa is of the few people in her community (which constitutes the whole rig) to forgo bio-engineered enhancements. As such, she’s the last truly organic person left on the rig – making her doubly an outsider, as well as a neglected daughter and bodyguard extraordinaire. Still, her expertise in the arts of self-defense and her record as a fighter mean that her services are yet in high demand. When the youngest Lynch needs training and protection, the family turns to Hwa. But can even she protect against increasingly intense death threats seemingly coming from another timeline? Meanwhile, a series of interconnected murders threatens the city’s stability and heightens the unease of a rig turning over. All signs point to a nearly invisible serial killer, but all of the murders seem to lead right back to Hwa’s front door. 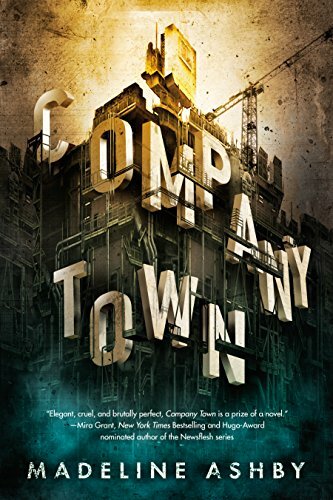 Company Town has never been the safest place to be – but now, the danger is personal. Anyway, the lesson here is that publisher websites should be as fully up-to-date as Amazon’s catalogue, if not ahead of the curve.